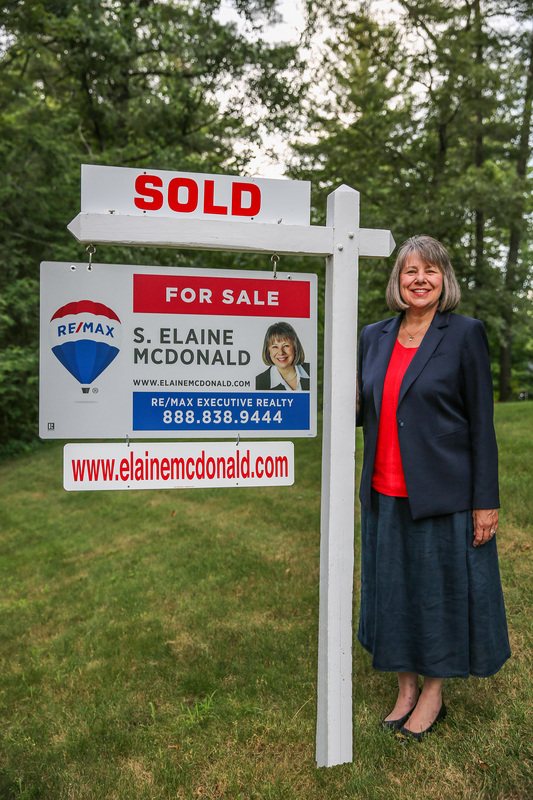 View the last 2 years of SOLD properties by the Elaine McDonald Team, as well as properties that are currently under agreement! Narrow your search to find what homes we have sold just like yours with the criteria on the right hand side of your screen! Don't forget to register to receive the most up to date information on the market today! Contact us today for a personalized market analysis of your home compared to those in your area! First time on the market! Set on a very special half acre corner lot, convenient to many amenities, this lovingly cared for home was custom built in 1984 for the family who still owns it. The heart of the house is its gracious living room with wood burning fireplace, opening to the formal dining room, which looks out upon specimen trees, roses, iris and well attended bird feeders. The oak cabinet kitchen steps down to an inviting three season sunroom, facing west over the garden & yard and connecting to the garage. There are 2 bedrooms and an updated full bath on each floor. The unfinished basement was built with the creation of a large family room in mind, with its 2nd fireplace and generous ceiling height. There is more undeveloped bonus space above the attached two car garage, with potential to become a home office or artist studio. Town water, private septic, very well maintained wood shingle exterior, 100 amp service. Listed by Holly Almgren of Coldwell Banker Residential Brokerage - Cambridge - Huron Ave. Welcome to 60A Central Street, Hudson! WELCOME TO 60A CENTRAL STREET, HUDSON, MA! This 3 bedroom, 2 full bath, pampered, charming Colonial is in pristine condition and is only a short walk to downtown Hudson where you can find a plentiful amount of restaurants, quaint shops, the library and access to the Rail Trail! New tastefully redone kitchen with loads of cabinets and granite counters plus a separate pantry area that provides access to a private new deck. Enjoy sitting in the front to back living room/dining room with a bay window and an exposed beam. Relax in the spacious master bedroom that is large enough to accommodate a king size bed. Gorgeous split staircase with loads of original detailing. Lovely front porch for your early morning coffee. The in-ground pool with a patio area is perfect for your summer enjoyment with family and friends. Shed/pool house would be ideal storage for your motorcycle and includes access via a garage door. Circuit breakers. This well maintained home is in an excellent commuter location with easy access to Rt 495/290/85/62. A RARE FIND! Click HERE to view the feature sheet larger or download and print. WELCOME TO 24 JOHN ROBINSON DRIVE, HUDSON, MA! Location, location, location! This three bedroom multi-bath Split home is situated in a wonderful sought after neighborhood and is within walking distance of Forest Ave School, the Rail Trail and provides superior access to Routes 495 and 290. The vibrant downtown Hudson area has so much to offer with top notch restaurants, shops, and much more. Enjoy the bright and cheerful living room with a cozy fireplace and large picture window. An open formal dining room and kitchen are perfect for your family enjoyment. The master bedroom includes a half bath. Hardwood floors are installed throughout the home, except the kitchen and baths. Both bathrooms have been updated with new toilets, vanities, and mirrors. The interior of this home has been completely painted in neutral tones making it easy to move in. Partially finished heated playroom is located in the lower level. New circuit breakers. Wonderful level spacious yard is ideal for cookouts or just relaxing. Outstanding value for the first time home buyer or someone looking to downsize. ! Immediate occupancy if needed! DO NOT MISS THIS EXCEPTIONAL BUY Click HERE to view the feature sheet larger or download and print. Welcome to 106 Russell Street, Marlborough! WELCOME TO 106 RUSSELL STREET, MARLBOROUGH, MA! This home says come on in! You will feel right at home the moment you step into this well maintained 3 bedroom charming Colonial situated on a side street near local area schools, the Solomon Pond Mall, Apex Center, and Rail Trail, which can be used for year round enjoyment. Lovely updated kitchen, which includes a pantry/sink area, large island for your morning coffee, and an economical gas stove. Open concept formal dining area, living room, and front porch are perfect for entertaining. Built-ins. Nicely cared for hardwood flooring throughout. Light and bright master with walk-in closet plus another closet for your storage needs. Two additional spacious bedrooms. Conveniently located mudroom has a washer/dryer hookup. 7 year old gas fired heating system and gas hot water tank. Circuit breakers. Superior access to Route 495/290/20/85. THIS GEM WILL NOT LAST! CLICK on the video below for highlights and special features of this home: Click HERE to view the feature sheet larger or download and print. Harvard style town home. Upon entry you will find the sunny 9x7 breakfast nook in this adorable galley-style kitchen with loads of cabinets and counterspace! Kitchen flows into a large living room/dining room with hardwood floors, wood burning fireplace, box window and sliders to a private backyard patio. Walk upstairs to two spacious bedrooms with full wall length closets also with hardwood flooring. The bedrooms share a Jack and Jill bath with tub and separate shower! Enjoy award winning Ridgefield Condominium's country club atmosphere with pool, tennis courts, basketball court, clubhouse with exercise room, and lighted sidewalks for your morning jog or evening stroll. Enjoy the maintenance free lifestyle of condo living! This is a special property and one you will enjoy calling home! Welcome to 4 Labelle Street, Marlborough! WELCOME TO 4 LABELLE STREET, MARLBOROUGH, MA! A commuters dream! You will feel right at home when you enter this "one-of-a-kind" 2-3 bedroom Colonial with a two car garage offering superb access to Routes 495 and 290! The nicely updated kitchen includes granite counters, a convenient breakfast bar and a side door that gives access to a large entertaining size deck with a hot tub included. Enjoy the open concept front to back dining and living area with gorgeous hardwood flooring and crown moldings. Large 23x10 master bedroom has a separate 10x9 sitting area and two spacious closets. Spiral staircase leads to a finished walkout lower level, which includes an office and bedroom with a private entrance that is ideal for an extended family situation. Nicely updated full bath. Spacious 19x10 laundry room. Central air conditioning for those warm summer nights and a nice level fenced yard perfect for outdoor activities. Situated on quiet side street near the Solomon Pond Mall, the Rail Trail, and Apex Entertainment Center. HOW SOON CAN YOU MOVE? CLICK on the video below for highlights and special features of this home: Click HERE to view the feature sheet larger or download and print. Click HERE to view the floor plan larger or download and print. Welcome to 33 Thomas Farm Circle, Shrewsbury! WELCOME TO 33 THOMAS FARM CIRCLE, SHREWSBURY, MA! You will love to entertain in this one-of-a-kind expanded Gambrel Colonial located on a quiet side street and situated on a gorgeous private 3/4 acre fenced level lot! Enjoy the use of the stunning 23x23 family room, which includes cathedral ceilings, skylights, a gas log fireplace with marble surround, and a wet bar. Bright and cheerful eat-in kitchen with breakfast bar. Stunning dining room with hardwood flooring and a chair rail. Beautifully appointed sunroom with two boxed windows and access to a spacious mahogany 24x12 deck. There are loads of custom oak moldings and built-ins, hardwood flooring, and detailing throughout this beautiful home. Quality 6 panel doors. A front porch. Loads of new features such as: a NEW heating system in 2011, NEW hot water heater in 2013, NEW Anderson Renewal windows in 2008, and a NEW patio French door in 2011. Stay cool on those warm summer days with central air conditioning. Keep the lawn watered with an irrigation system and tools put away in the large shed. Superior access to the train, major shopping, highways, and recreational facilities! SEEING IS BELIEVING! CLICK on the video below for highlights and special features of this home: Click HERE to view the feature sheet larger or download and print. Welcome to 52 Onamog Street, Marlborough! WELCOME TO 52 ONAMOG STREET, MARLBOROUGH, MA! The quiet setting and gorgeous views enhance this 4 bedroom 2 full bath Cape Gambrel that is nicely situated on a peaceful side street and is located only a short walking distance to restaurants, shopping, and the library! Sunny, very open kitchen with white cabinets and new tile flooring provide easy access to a 19 x 12 deck that is great for entertaining. Spacious dining room with a new sliding glass door is perfect for family dinners. Nicely updated bathrooms with new tile flooring. Living room with large bay window and hardwood flooring is ideal for watching your favorite sporting event. First floor bedroom/office. Large 23x15 master bedroom with vaulted ceilings includes two closets plus a loft area for additional storage. Three rooms in finished walk-out lower level are ideal for a playroom, bedroom/family room. New Energy Star vinyl windows. Economical FHA gas heating system. Central air conditioning. Beautiful brick walkway and superb access to Routes 495, 290, and 90. HERE IS THE HOME YOU HAVE BEEN WAITING FOR! CLICK on the video below for highlights and special features of this home: Click HERE to view the feature sheet larger or download and print. Welcome to 80 West Hill Road, Marlborough! WELCOME TO 80 WEST HILL ROAD, MARLBOROUGH, MA! Outstanding value for this 3-4 bedroom 2 full bath Cape that has had quite a few major renovations in the last few months! This lovely home abuts conservation land for your outdoor enjoyment and is only minutes away from all major highways for easy commuting! Nicely designed new bathrooms with granite counters and full tub enclosures. Living room includes a wood burning fireplace, hardwood flooring, and a large picture window. Enjoy the warmth and beauty of new vinyl Anderson windows, new vinyl siding, new plumbing, new exterior doors, and new front steps. Bright and cheerful new kitchen with granite counters, stove, dishwasher, and an 11x6 eat-in area. Turn-in for the night in the spacious 18x13 master bedroom large enough for a king size bed. Second floor laundry includes a closet , which is a possible 4th bedroom. New wall to wall carpeting. New circuit breakers. New landscaping. Newer oil tank. Seller will connect to public sewer by closing. Superior access to schools, shopping, and recreational facilities. START THE NEW YEAR OFF WITH A NEW HOME! CLICK on the video below for highlights and special features of this home: Click HERE to view the feature sheet larger or download and print. Click HERE to view the floor plan or download and print. Welcome to 58A Houghton Street, Hudson! WELCOME TO 58A HOUGHTON STREET, HUDSON, MA! This gorgeous 2-3 bedroom Antique Colonial pampered beauty has charm galore and is walking distance to the sought after area of downtown Hudson! Loads of hardwood flooring, to include maple and southern pine. Crown moldings and quality detailing throughout. Large eat-in country kitchen with access to a 6x6 pantry. Convenient first floor laundry/mudroom area. Stunning living and dining room with beautiful custom built-ins. Ideally situated cozy pellet stove for those cold winter nights. Sitting/office area with cathedral ceilings also provides exterior access. Breathtaking 8x3 vestibule with glorious stain glass windows. Master bedroom includes a 11x7 large walk-in closet as well as a walk-out bay window. Spacious additional bedroom with walk-in closet and separate nursery. Lovely front porch and wrap around rear deck. New wall to wall carpeting. Superior access to highways, playground with a splash pad and skating park, shopping, restaurants, and schools. NOW YOU CAN HAVE THE HOME THAT YOU HAVE ALWAYS WANTED! CLICK on the video below for highlights and special features of this home: Click HERE to view the feature sheet larger or download and print. A rare find- a resale at the Villages at Walker Meadow. Located on a quiet cul-de-sac, this home offers beautiful views of nature from the three season room, living-room and master-bedroom. Enjoy ONE-LEVEL-LIVING with an open concept. The front to back living room/dining room with crown molding and wainscoting is perfect for entertaining while the kitchen/eating area is cozy space for just hanging out. Extend your living area in the Spring, Summer and Winter months in the sunny three-season room. Directly access the kitchen from the garage; a huge plus on grocery shopping day. The generously sized master bedroom with tray ceilings has ample space for all your furniture. It is also a short distance to the clubhouse with offers an exercise room, library, function room and full kitchen. Other community features include walking trails, putting green, social events and activity groups. Add central air, gas fireplace and hardwood flooring for the complete package. A wonderful place to live. Listed by Denise Noyes of Coldwell Banker Residential Brokerage - Worcester - Park Ave.
One level living at its best!! Open floor plan with lots of great living space and Central Air as a bonus. In the beautiful town of Holden and in a great neighborhood with impeccable highway access sits this great 3 bedroom ranch. Beautifully updated bathroom with granite counters and tile shower. Hardwoods & generous closet space. Living room space and family room space. Expanded space in the basement would make a great office or bonus room. Laundry hookups on first level or basement level. Great 3 season room off the back looking out over a spacious fenced-in back yard. Welcome to 10 Baldwin Avenue, Marlborough! WELCOME TO 10 BALDWIN AVENUE, MARLBOROUGH, MA! Delightfully pleasant custom open concept 3 bedroom 2 full bath Ranch located on a quiet side street near Memorial Beach, Jarowek Elementary School, Marlborough Middle School, and Marlborough High School with superior access to highways, shopping, and restaurants! Nicely designed 27 x 11 updated contemporary style kitchen with granite counters, stainless steel appliances, a spacious eat-in area, and plenty of cabinets. Large living room with bay window and wood stove is perfect for relaxing by the fire. Updated bath with full tub/shower, tile flooring, and granite counter. Turn in for the night in the 14 x 11 master bedroom with a full bath. Loads of hardwood flooring throughout. Fabulous family room with tiled flooring in lower level plus a forth bedroom/office/playroom. Entertaining size patio for barbecues and family get togethers. One car garage plus a storage area. Plenty of off street parking. Access to private neighborhood beach at end of Meadow Road. COME SEE THIS OUTSTANDING VALUE! CLICK on the video below for highlights and special features of this home: Click HERE to view the feature sheet larger or download and print. Welcome to 36 Causeway Street, Hudson! WELCOME TO 36 CAUSEWAY STREET, HUDSON, MA! Attention nature lovers...this is your oasis! A tranquil wooded 3/4 acre setting envelopes this dramatic 3-4 bedroom 3 full bath 58 foot California Contemporary home with cathedral ceilings, exposed beams, and loads of windows. Breathtaking one-of-a-kind two-story glass solarium with spiral staircase leads to an indoor heated sunroom/garden area that provides access to the large deck perfect for entertaining. Inviting formal living room and dining room. Open concept sun-filled kitchen with stunning views of the rear yard. Enclosed 14x13 screened porch is ideal for enjoying your morning coffee and nature at its best. Two custom floor to ceiling fireplaces with built-ins. Oversize master with full bath. Family room/office/laundry room located in the finished lower level. Mahagony front entryway stairs. Central air conditioning. Recessed/track lighting. Two car garage. The extensive natural landscaping/gardens are peaceful and perfect for bird watching. Private storage shed under porch/deck. YOUR CHANCE TO ESCAPE FROM THE COMMON PLACE! CLICK on the video below for highlights and special features of this home: Click HERE to view the feature sheet larger or download and print. Welcome to 33 Chase Road, Marlborough! WELCOME TO 33 CHASE ROAD, MARLBOROUGH, MA! Quality surrounds you in this "one-of-kind" custom 3-4 bedroom, 2.5 bath Gambrel Cape located on a quiet cul-de-sac on the west side near all major conveniences. Outstanding updated kitchen with large center island, granite counters, and separate eat-in area. Formal dining and living room are great for entertaining. Make use of the 17x13 family room, which could be used as a first floor bedroom, with a fireplace and built-ins. Loads of gorgeous hardwood flooring and detailing can be found throughout this home. Turn in for the night in the large 24x11 master bedroom. Relax in the screen porch with stunning views of the breathtaking well manicured yard with loads of perennial gardens, peaceful fire pit area, and a large shed for the hobby enthusiast. Playroom/office/sitting room are located in the finished walk-out lower level with a full bath, cedar closet, and additional storage making it ideal for extended family. Apex Center, Rail Trail, conservation land, schools, and Wegman's nearby and easy access to all major highways. Well maintained over the years by current owners. MUST BE SEEN TO BE APPRECIATED! CLICK on the video below for highlights and special features of this home: Click HERE to view the feature sheet larger or download and print. Welcome to 29 Upland Road, Marlborough! WELCOME TO 29 UPLAND ROAD, MARLBOROUGH, MA! Your spirits will soar when you see this 1,600 square foot one level Ranch in the Fort Meadow area with access to a private neighborhood beach that provides boat access and multiple water activities. Spacious living room with fireplace has a large picture window. Updated maple kitchen, in 2003, with a gas stove plus a hall pantry. Separate dining area is perfect for family dinners. First floor features hardwood flooring, except kitchen and bathrooms. Master bedroom includes a convenient half bathroom. Family room and office/4th bedroom are located in the walkout lower level. New driveway (2017). New architectural shingled roof (2016). Gas hot water tank (2014). Forced hot air gas heating system (2003). Siding and windows (2001). Plumbed for central air conditioning. Backyard perfect for entertaining. Conveniently located near conservation land, the Rail Trail, Fort Meadow Lake, the new Apex Center, and all major highways. AN OUTSTANDING VALUE! Click HERE to view the feature sheet larger or download and print. Welcome to 98 Fort Meadow Drive, Hudson, MA! WELCOME TO 98 FORT MEADOW DRIVE, HUDSON, MA! Come see this pampered beauty of a home! This contemporary design multi-level 3 bedroom 2 full bath home has been well maintained over the years by the original owners. Open concept, very versatile, 32x20 great room ( family room/eat-in area combination) with a cozy gas log stove provides direct access to the patio, which is perfect for large family gatherings. Sun drenched kitchen with a breakfast bar, gas stove, and loads of natural light spilling in during the day. Spacious formal dining and living room. There are loads of hardwood flooring and cathedral ceilings throughout this home. Master bedroom can support a king size bed. Crafts/exercise/playroom with built-ins are located in the finished lower level. Central air conditioning for those warm summer months. New roof (50 year architectural shingles). Short walk to Centennial Beach allows for swimming, boating, fishing. Restaurants and shopping are located in the vibrant downtown Hudson area nearby. Superior access to Rt 495/290/85. COME SEE FOR YOURSELF AS YOU WILL NOT BE DISAPPOINTED! CLICK on the video below for highlights and special features of this home: Click HERE to view the feature sheet larger or download and print. Welcome to 63 Fort Meadow Drive, Hudson! WELCOME TO 63 FORT MEADOW DRIVE, HUDSON, MA! Vacation year round in this WATERFRONT 3-4 bedroom 2 bath Ranch offering spectacular views of 260 acre Fort Meadow Lake! Updated kitchen with granite counters and stainless steel appliances. Eat-in area with hardwood flooring opens to a living room with a fireplace perfect for entertaining. Breathtaking views from the master bedroom, which includes a French door that provides access to a large deck ideal for your morning coffee. Tastefully updated main bath includes a soaking tub, granite flooring, and granite counters with a double vanity. Office or forth bedroom is located in the walkout lower level and is perfect for expansion possibilities. Two car garage. Newer economical gas heat/hot water. Public water and sewer. Enjoy boating, fishing, skiing or watching the ducks, blue herons, and eagles from your very own backyard! Superior location near Routes 495/290/85 and the vibrant downtown Hudson area with wonderful restaurants and shops. A RARE FIND! CLICK on the video below for highlights and special features of this home: Click HERE to view the feature sheet larger or download and print. Welcome to 33 Belleview Avenue, Marlborough! WELCOME TO 33 BELLEVIEW AVENUE, MARLBOROUGH, MA! Sought after dead end street location comes with this 3-4 bedroom 2 full bath well constructed custom Cape nestled on a tree lined street near all major conveniences, highways, and schools! Large eat-in country kitchen wonderful for holiday gatherings. Relax in the 9x9 enclosed porch perfect for enjoying your morning coffee. Living room perfect for entertaining includes an oversize picture window. Formal dining room or easily use as a first floor master bedroom. Loads of hardwood flooring throughout this wonderful home. Spacious 18x14 master bedroom. Newer American Standard economical gas heating system and hot water heater installed in 2010. Walkout basement ideal for expansion possibilities. Easy access to Wegman’s the New England Sports Center and the new Apex Center for year round entertainment, and the list goes on. BE IN FOR THE HOLIDAYS! Click HERE to view the feature sheet larger or download and print.